I have to confession to make, I have been wearing a mask. And, it’s not just this Glyco Lactic Radiance Renewal Mask. It’s actually my make up! I am still using the Flash Hydro Boost Daily. Except for the ‘Lost Week’! But, I still love it and I am now getting to the point in the weather and my skin where I think I’ll layer it with another moisturiser (as directed), to give my skin more of a fighting chance against the elements. If you want to see my full review, it’s here: Flash Hydro Boost Review. But, alas, I know exactly what has been stealing that glow: I had a couple of weeks where I just wasn’t sleeping and my whole body suffered. A good moisturising and nutrition routine works wonders. But, the mask of makeup I’ve been hastily trowelling on to compensate for the lack of sleep has been a recipe for certain skin dullness (verdict: Too matte, far too matte). So, at the moment, it’s time to experiment with different cosmetic products and my make up application. And this is also the perfect time to add a new mask to my routine to give it all a little extra boost. Step forward the Glyco Lactic Radiance Renewal Mask because there is always room for renewed radiance! I actually filmed a whole first impressions video for our YouTube channel. In it, I am makeup free throughout. Don’t be scared (even though I did film it over Halloween), I just wanted to give a really full review. We’re in the process of moving, so bear with me, I’ll get it up as soon as possible! So, what is this mask all about? The Glyco Lactic Radiance Renewal mask is an exfoliating, decongestant and brightening mask. It’s not a peel off and it’s not a traditional exfoliant scrub. It all feels quite gentle, despite the 6.5% glycolic acid (it doesn’t contain the highest % of glycolic you can get, but it’s definitely there, along with other fruit acids, which are the key ingredients for the skin renewing and smoothing qualities). The results for me are much better than any other scrubs and peels and have come with absolutely zero irritation. And, definitely not a micro bead in sight. The muslin cloth is fairly thin and so it also rinses off easily. I just make sure it’s fully clean and hang it up to dry. I’ve used it a couple of times and it fairs ok. It’s not one you’d keep for years (would you want to? ), but I think it will last you the length of the product at least. I can let you know when I get to the end of it. I wanted to give it a more thorough clean, but I didn’t want to mix detergent with it, and it’s far too small to go in a wash on its own, so for that I just boiled it! I’m sure you could use any clean muslin cloth though. As a mum, I am fully kitted out with muslins! Pretty straight forward: Apply the mask to your clean skin and neck via the pump dispenser. Smooth it on (avoiding the eye area – the first time, I got carried away and did go under my eyes. Not recommended, though I am pleased to say, they are OK. Phew!). Wait 10 minutes. Then dampen the muslin cloth that comes with it under warm water and use the cloth to wipe off all the product. The mask almost feels like runny honey in texture – but, not so sticky! It smells delicious and citrusy but in a very light and not over powering way. It sits on your skin very comfortably and is not one of those that pulls or dries. In fact, quite the opposite – I looked like an oil slick with it on! Seriously, look at the photo! I had a slight tingle when I first applied (which the box says you might experience) and that was it. No irritation. At all. Even on my poor eye area that I gleefully covered and then realised I shouldn’t have and hastily had to wipe it off! And, although it feels and looks like honey, it comes off really easily and cleanly with the muslin cloth. Yup, REN clean skincare strikes again! I’m getting braver with these selfies! My skin felt impossibly soft afterwards, so much so that the first time I just applied my Flash Hydro-Boost afterwards and didn’t bother with any makeup, except a slick of eyeliner (essential!). It seemed a shame to. The combination of the two is just parfait! But, the website does recommend you follow up with their Bio Retinoid Anti Wrinkle Concentrate and also an SPF like their Satin Perfection BB Cream as your skin will be more susceptible to the UVA UVB rays and it’s just good skin practice anyway! My pores are minimised, my skin is so much smoother. I had a bit of a problem pore area on my chin, which I only noticed when I was taking some pics for my Invisalign story (yes, I’m now wearing invisalign clear braces! Read more on my experience with Invisalign here). After using the mask, it’s as if that chin episode never even happened – congestion is all but gone. I have also noticed a toning effect in my areas of pigmentation, so I can really see it having some great advantages over the coming months. Unlike the Flash Hydro-Boost, this one states it is not suitable for sensitive skin. My skin can be sensitive and very temperamental, as I mentioned in the last review and I have had no issues with any REN products. BUT, I would say, if you have any sensitive skin, it’s best to avoid this one. Sorry. But, if your skin isn’t sensitive and you’re looking for a gentle feeling mask that actually works an absolute charm to tone, smooth and exfoliate – this is definitely worth a try. For me, the radiance comes more from the fact that you will be revealing a fresh layer of baby soft skin, rather than from its hydrating properties. Which is why I love it with the Hydro Boost. This is the kind of mask you only need to use once a week to get the full benefit. More than that is not recommended. Price wise, it’s £34* for a 50ml tube with cloth. You use it once a week and I think 1-2 pumps is more than enough, so I think represents good value. *Update 26/10/2017: Now on offer. Absolutely. 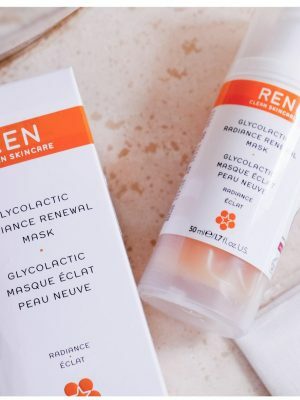 If your skin isn’t sensitive and you’re looking for a really good way to smooth your skin and decongest it, the Glyco Lactic Radiance Renewal Mask is your chap. On the appearance of fine lines, it works well for me, but obviously, that’s as far as its powers extend for wrinkles. Next step for me was a new moisturiser and cleanser! A 50ml tube is 34.00 and you get two free samples with every order. I’d love to know what you use? If you use REN Skincare, do let me know what your favourites are! I love masks that have that exfoliating effect, I often do one before bed and then put a skin care oil on overnight. My skin always feels super soft the next day. I would definitely try this product, your skin looks fabulous after using it! Sounds like a good value product to me! And let's face it, when it works (like it has done for you), then it doesn't matter so much what you pay, does it? Your post has just reminded me how much i've been neglecting my skin and I really need to adopt a skin care routine. My skincare routine is basically a daily shower. I actually own no products and don't wear make up but this looks like a good product. I might try it. My skin is super sensitive at the moment as I'm pregnant - even washing my face or coming out of the shower leaves it all blotchy and red -so I wouldn't be able to try this until that's all calmed down. But I do like a good mask - anything to try and get the glow back! Like the look of Ren - but have never tried any of their products before.